This topic explains the Matrix Generator. ▪ Now, configure your virtual LED matrix according to the following settings. 1] Open the Matrix Generator. 2] Set up all settings, including Fixture, Placement, and Addressing. 3] Click Apply to confirm your settings and MADRIX will create the Patch file for you. - Click OK to confirm your settings and to close the Matrix Generator. - Click Cancel to discard any changes and to close the Matrix Generator. In this user guide it is not possible to give universal recommendations for the required settings, because every LED project is different. You need to configure the settings of the Matrix Generator according to your individual LED setup. This section defines which fixtures you want to use. Note: If DVI is selected, all controls that are not relevant to DVI fixtures will be disabled. ▪ Product - Second, choose your exact LED product. - You can use the downward triangle to call up the complete list of fixtures. - Perform a left mouse click and you can use the input field as a filter to type in the fixture you are looking for. ▪ Start Fixture ID - Defines where MADRIX starts indexing fixtures. The Fixture ID is a unique identifier for each fixture that is added. - When using the Matrix Generator, the default setting is also recommended setting. ▪ A general option for DMX: Select !generic RGB Light 1 pixel for any LED product with RGB LEDs and 3 DMX channels. ▪ A general option for DMX: Select !generic RGBW Light 1 pixel for any LED product with RGBW LEDs and 4 DMX channels. This section defines how many fixtures you want to use and how they are placed. 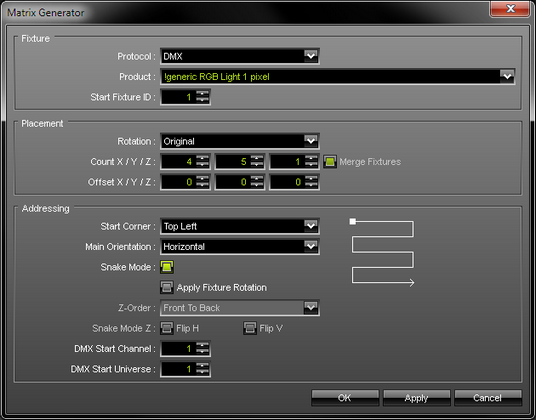 ▪ Rotation - Uses the original rotation of the fixtures, as defined in the »MADRIX Fixture Editor. Or you can add to all of your fixtures a rotation of 90°, 180°, 270°. ▪ Count X / Y / Z - Defines the number of LED fixtures you are using. - X sets the number of fixtures on the X-axis [horizontal; width]. - Y sets the number of fixtures on the Y-axis [vertical; height]. - Z sets the number of fixtures on the Z-axis [level; depth]. - Please set up the number of fixtures you are using. Do not enter the total number of pixels. All fixtures are already implemented with their specific number of LED pixels. - When setting up a 2D virtual LED matrix, Z should be 1. If Count Z is higher than 1, you will automatically create a LED matrix. ▪ Offset X / Y / Z - Adds spacing [gaps] to your virtual LED matrix separately for the X-axis, Y-axis, and Z-axis. The value defines the size of the gaps between fixtures in pixels. A value of 0 means that all fixtures are placed next to each other without spacing. For example, a value of 1 means that 1 pixel spacing is added between fixtures. ▪ Note: When using DMX-based products, please pay attention to the maximum number of DMX channels according to your MADRIX license version and according to the performance of your PC. ▪ Note: When using DVI-based products, please pay attention to the maximum number of supported DVI pixels according to your MADRIX license version and according to the performance of your PC. This section defines the numbering of fixtures [DVI] and addressing of fixtures [DMX]. Since MADRIX will do this automatically, certain parameters need to be specified by you on how MADRIX should number or address fixtures automatically. ▪ Apply Fixture Rotation - Only works when Snake Mode is enabled. Rotates fixtures in each alternating row by 180°. ▪ Z-Order - Is only available for 3D. Defines if addressing in 3D starts with the first Z-axis in front [Front To Back] or with the last Z-axis in the back [Back To Front]. ▪ Snake Mode Z - Is only available for 3D. Automatic addressing of fixtures on the Z-axis is done level by level. Activate this option if the Start Corner for each alternating level should be different. - Flip H - Switches the Start Corner horizontally [e.g., from Top Left to Top Right]. - Flip V - Switches the Start Corner vertically [e.g., from Top Left to Bottom Left]. 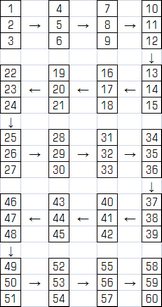 - Activate both, Flip H and Flip V, to assign the complete opposite Start Corner [e.g., from Top Left to Bottom Right]. ▪ DMX Start Channel - MADRIX will start the addressing using this DMX channel and automatically increment the DMX channel for each fixture. - Valid values range from 1 to 512. ▪ DMX Start Universe - MADRIX will start addressing using this DMX universe and automatically increment the DMX universe for fixtures when necessary. - A total of 512 DMX channels is available per DMX universe. - If your fixture addressing is greater than 512, MADRIX will automatically assign a new DMX universe and start at DMX channel 1 in this new universe again. ▪ Press Apply to confirm your settings. ▪ Without Snake Mode, MADRIX will address row by row or column by column [e.g., left to right, left to right, left to right, etc.]. ▪ With Snake Mode, MADRIX will use alternate directions for each row or column [e.g., left to right, right to left, left to right, etc.]. 1] Configure all Settings as described above, except DMX Start Channel and DMX Start Universe. The fixtures are pre-patched and included with their amount of pixels. Please only define how many fixtures you are using and not the total number of pixels. If your are using a PDS-150, a sPDS-480ca, or a PDS-60ca with one or two strings per controller, please select the correct fixture. ▪ The maximum value you can enter is 65536 by default. ▪ Please note that this is a theoretical limit. ▪ The maximum value that can be used depends on the capabilities of your computer. - The available, contiguous memory also defines the maximum available resolution [RAM; up to the theoretic maximum of 2 GB as a 32-bit application, which is much lower in practice]. - It is not feasible to set up extremely high resolutions, such as 65536 x 65536 x 65536 or 500 x 500 x 500, for example. - High values can be useful when setting up extremely rectangular 2D matrices, such as 10000 x 20 x 1 or 20 x 10000 x 1, for example. ▪ The maximum value you can enter is 256 by default. ▪ You can change the maximum value in by changing the Virtual DMX Universes setting in the Options. ▪ It is possible to use more virtual DMX universes than actual DMX universes by using less than 512 DMX channels per universe. ▪ The actual number of DMX universes [i.e. DMX channels] that can be used for output depends on your MADRIX KEY software license. ▪ MADRIX offers many more options to configure your virtual LED matrix.